UltraFiltration (UF) is a type of membrane filtration similar to Reverse Osmosis, using hydrostatic pressure to force water through a semi-permeable membrane. UltraFiltration is a pressure-driven membrane process not fundamentally different from reverse osmosis (RO), microfiltration (MF) or nanofiltration (NF), except in terms of the size of the molecules it retains. The pore size of the ultrafiltration membrane is usually 103 - 106 Daltons. UF is a barrier to suspended solids, bacteria, viruses, endotoxins and other pathogens to produce water with very high purity and low silt density. Suspended solids and solutes of high molecular weight are retained, while water and low molecular weight solutes pass through the membrane. A semi-permeable membrane, is a thin layer of material capable of separating substances when a driving force is applied across the membrane. Once considered a viable technology only for desalination, membrane processes are increasingly employed for removal of bacteria and other microorganisms, particulate material, and natural organic material, which can impart color, tastes, and odors to the water and react with disinfectants to form disinfection byproducts (DBP). As advancements are made in membrane production and module design, capital and operating costs continue to decline. UltraFiltration is used to remove essentially all colloidal particles (0.01 to 1.0 microns) from water and some of the largest dissolved contaminants. The pore size in a UF membrane is mainly responsible for determining the type and size of contaminants removed. In general, membrane pores range in size from 0.005 to 0.1 micron. UF membrane manufacturers classify each UF product as having a specific molecular weight cutoff (MWC), which is a rough measurement of the size of contaminants removed by a given UF membrane. Ours removes all molecules larger than .2 microns and many smaller than that. A 100,000 MWC UF membrane means that when water containing a given standard compound with a molecular weight of around 100,000 daltons is fed to the UF unit, nearly all of the compounds will not pass through the membrane. Substances with a molecular weight of 100,000 daltons have a size of about 0.05 microns to about 0.08 microns in diameter. UF membranes are used where essentially all colloidal particles (including most pathogenic organisms -- parasites and bacteria) must be removed, but most of the dissolved solids may pass through the membrane without causing problems downstream or in the finished water. UF will remove most turbidity from water. The water flows through the UF membrane at a rate that is slower than with other filtration media, but rapid enough to collect without need of a holding tank or a long period of waiting to fill a collection vessel. All components of our water systems are free of BPA. to better address both chlorine and the chloramines now used by many cities. Contact us for pricing of stainless steel housings available at additional cost. CLICK HERE for Payment Details. 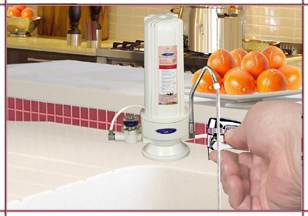 UltraFiltration Triple Counter Top Flow Through Water Purifying System -- Three standard size housings, about 15 in. wide including spout, containing: 8 stages of filtration: solid carbon block (1st housing) (change every 1 to 1 1/2 years); UltraFiltration membrane (2nd housing) (change every 2 to 2 1/2 years); "Smart" multi 6-stage filter cartridge: 1 micron pre-filter, ERA-6500, ERA-9500, Granular Activated Carbon (GAC), ion exchange resin, 1 micron post filter (3rd housing) (change every 1 1/2 to 2 years). For city water or low sediment rural water with a pH of 7 or above. Produces near reverse osmosis water purity in a flow through unit. Capacity: 6,000 to 8,000 + gallons. Includes stainless steel diverter valve & inlet hose, plus stainless steel spout attached to 3rd housing. NOTE: Bone char carbon is a unique carbonaceous adsorbent manufactured from the treatment and carbonization of selected grades of animal bone and is used for liquid phase filtration to remove organic and inorganic species such as colored bodies and many heavy metals. Bone char is different from activated carbon in that it contains both carbon surface area and hydroxyapatite lattice surface area. Alumina (aluminum oxide) is available as an alternative media for fluoride removal for those who prefer it over bone char carbon, vegans for example. Triple Fluoride Removal UltraFiltration Counter Top Flow Through Water Purifying System -- Three standard size housings, about 15 in. 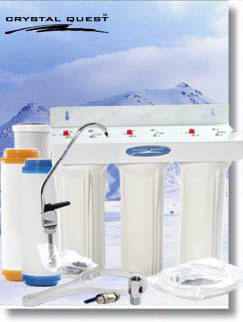 wide including spout, containing 9 stages of filtration: "Smart" multi 6-stage filter cartridge (1st housing): 1 micron pre-filter, ERA-6500, ERA-9500, Granular Activated Carbon (GAC), ion exchange resin, 1 micron post filter (change every 1 1/2 to 2 years); UltraFiltration membrane (2nd housing) (change every 2 to 2 1/2 years); special cartridge* for maximum removal of fluoride, lead and arsenic (3rd housing) (change every 1 to 1 1/2 years). For city water. Produces water purity more like reverse osmosis (not as thorough) in a flow through unit (no holding tank). Best removal of contaminants including fluoride in a flow through unit. Capacity: 4500 ppm fluoride, approx. 2,500 gallons for fluoride cartridge; approx 8,000 gallons for other cartridges. Includes stainless steel diverter valve & inlet hose, plus stainless steel spout attached to 3rd housing. 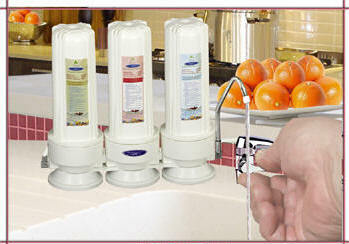 UltraFiltration Flow Through Unit As Add-on To Counter Top System -- Standard housing about 4 in. wide, with UltraFiltration membrane (change every 2 - 2 1/2 years - more often with well water). Produces nearly reverse osmosis water purity in a flow through unit (no holding tank). Capacity: 8,000 + gallons. Includes connector to add-on to existing standard heavy duty system. 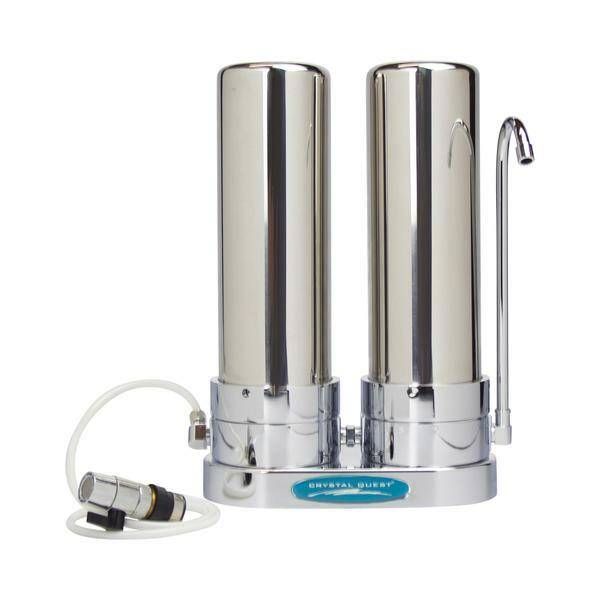 UltraFiltration Dual Under Counter Flow Through Water Purifying System -- Two standard size housings, about 11 in. wide total, containing: 7 stages of filtration: UltraFiltration membrane (1st housing) (change every 2 to 2 1/2 years - more often with well water); "Smart" multi 6-stage filter cartridge: 1 micron pre-filter, ERA-6500, ERA-9500, Granular Activated Carbon (GAC), ion exchange resin, 1 micron post filter (3rd housing) (change every 1 1/2 to 2 years). For city water or low sediment rural water with a pH of 7 or above. Produces nearly reverse osmosis water purity in a flow through unit (no holding tank). Capacity: 8,000 + gallons. Includes valve* to tap into cold water line, counter top faucet for edge of sink, and washers, hoses, etc., for installation; plus bracket for mounting under sink. *IMPORTANT NOTE: Please specify in comment section of order entry screen whether your cold water line is copper pipe or flex synthetic tubing so the appropriate valve can be included with your unit. 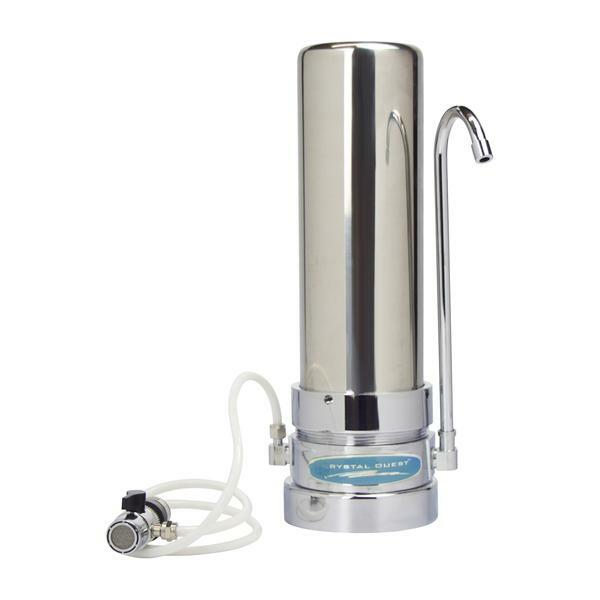 UltraFiltration Triple Under Counter Flow Through Water Purifying System -- Three standard size housings, about 15 in. wide total, containing: 8 stages of filtration: solid carbon block (1st housing) (change every 1 to 1 1/2 years); UltraFiltration membrane (2nd housing) (change every 2 to 2 1/2 years - more often with well water); "Smart" multi 6-stage filter cartridge: 1 micron pre-filter, ERA-6500, ERA-9500, Granular Activated Carbon (GAC), ion exchange resin, 1 micron post filter (3rd housing) (change every 1 1/2 to 2 years). *IMPORTANT NOTE: Please click here to specify in a note to us whether your cold water line is copper pipe or flex synthetic tubing so the appropriate valve can be included with your unit. UltraFiltration Flow Through Unit As Add-on To Under Counter System -- Standard housing about 4.5 in. wide, with connector and UltraFiltration membrane (change every 2 - 2 1/2 years - more often with well water). Produces nearly reverse osmosis water purity in a flow through unit (no holding tank). Capacity: 8,000 + gallons. Includes connector to add-on to existing Heavy Duty system. We have been in the water purification business for over 40 years. NOTE: For those on fluoridated city water, our special flow through units for fluoride removal, or our reverse osmosis systems will thoroughly eliminate fluoride. All of our drinking water purifiers have replaceable cartridges, and clear installation instructions. We also have whole house systems. CLICK HERE for pictures of our purifiers. CLICK HERE for shower & bath purifiers. 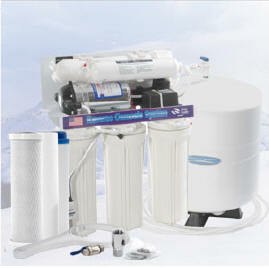 CLICK HERE for Reverse Osmosis systems. CLICK HERE for flow-through UltraFiltration. CLICK HERE for fluoride removal water systems. CLICK HERE for pour through Pitcher Water Filters. CLICK HERE for details of redox & carbon water purification. CLICK HERE for "Corrected Water" remineralizing alkalizer units. CLICK HERE for combination water purifier, cooler, and heater units. CLICK HERE for whole house systems that can purify all the water in your home. CLICK HERE to view the ISO, NSF and CE certifications for our water purifier systems. We also offer Ultra Violet units for water with bacteriological problems. NOTE: You can purchase the products presented at any of our websites with confidence of their quality and of the integrity of the companies that provide them. Copyright 2011-2019 by Natural Health Enterprises -- All rights reserved. Our clickable pay links take you to the PayPal secure online payment service, where you can use your major credit card or debit card, or your PayPal account (if you have one), in a totally safe & secure process. For items on this page, just click the pay link for the item or package you select. Upon completing the PayPal payment process, if you click "Continue", you will go to a page with links to several of our sites. From there, you can come back to this site if you want to order another item, which may be sent to some other address. After making your payment, PayPal will send an email to you confirming your order details. (It is possible that this email could be blocked by a SPAM filter at your internet service provider.) Allow up to 10 days or so for processing, packing, shipment and delivery. If you have not received your order within an appropriate time, contact us so we can check on it. IF YOU WANT TO PAY BY PHONE using either your checking account or a credit card or debit card, call us toll-free at 1- 800-542-1923 (10 am to 5 pm Eastern Time, Monday-Friday). You can "snail mail" a check or Money Order made out to "Natural Health" by contacting us for our mailing address. NOTE: There will be a $10 surcharge processed on your checking account if your check is returned for insufficient funds. The shipping charges at this website are for destinations in the contiguous United States. For locations in Alaska, Hawaii, Canada, Mexico, and other nations, contact us about ordering. 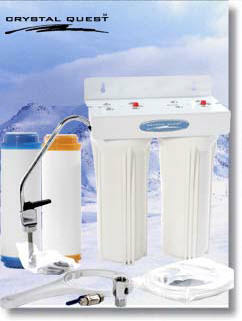 Most of our water purifier products are shipped directly from the manufacturer. If you have a question, contact us.